No part of this publication may be reproduced, stored in a retrieval system, or transmitted, in any form or by any means, electronic, mechanical, photocopying, recording or otherwise, without the prior permission of the publishers.The author asserts the moral right to be identified as the author of this work. whose tryst with destiny has an admirable commitment to the India that defines us. As a debutant playwright I do not have a circle of writer friends to whom I could have turned for advice. However, I am indeed fortunate to have had the benefit of responses on the first draft of the play from several friends across the globe on whom I imposed myself;I have reconnected with some of them after many years, having lost contact due to preoccupations in Uttar Pradesh politics. Many of them have been good friends from school and college; others are distinguished people in public life and prominent academics whom I have met over the years but perhaps been truant in not keeping in closer and constant touch, sadly to my loss alone. But first I must record an acknowledgement for late Marcus Murch of Shakespeareana fame who initiated me into theatre and so much more. Two eminent scholars and fine critics, Shamsurrehman Faruqi and his historian daughter, Professor Mehr Afshan Farooqi of the University of Virginia, who read the draft laboriously and made sensitive suggestions that I hope are adequately reflected in the final script of the play. Mahmood Farooqi, a promising scholar in his own right, an accomplished actor and a fellow Oxonian, generously gave his time for a detailed discussion and loads of encouragement. The appearance of a Dastango in the play, although very briefly, is my personal tribute to his commendable work in reviving that medieval institution of storytelling. Professor Gopi Chand Narang is a remarkable Urdu scholar, an icon of cultural and linguistic integration, family friend, and presently the President of the Sahitya Akademi. Despite his demanding schedule, he found the time to read the complete draft and in his impeccable polite manner, nudged me towards greater literary felicity. Professor Qamar Rais, an eminent Marxist critic, General Secretary of the Progressive Writers’ Association and Vice Chairman of the Delhi Urdu Academy, generously not only read the complete text and responded with valuable suggestions but also contributed substantially to the staging of its first performance in Urdu. Professor Theodore P. Wright read the text with the interest and meticulousness of a tutor and indulgently allowed me the benefit of his vast knowledge and experience of India. Professor Majid Siddiqui was the first scholar with whom I discussed at some length the historical format of the play when it was still somewhat hazy. His reassuring demeanour and candid encouragement most certainly helped me move forward and put pen to paper. Roshan Seth, Naseeruddin Shah, Girish Karnad, Farooq Sheikh shared some very valuable ideas on theatrical excellence, some perhaps too demanding of a novice like me. I do hope that they will not be disappointed. Huzefa Khalil’s comments on aspects of Muslim identity in the making of modern India were most useful in sharpening the focus of the central theme of the play. Governor Gopal Gandhi, a playwright and admirer of Dara Shukoh, graciously gave me a detailed response and a generous offer to join a play reading session, which alas could not be possible, mainly because of my political engagements and long absences from Delhi on political assignments. The timing of the 1857 anniversary celebrations did not permit a more leisurely reflection as fresh materials surfaced constantly. But Rina and Chintamani Rao, Mala and Jugnu, and Moses Manoharan took it upon themselves to get me to complete the play by prodding me on each time contemporary mundane concerns or internal constraints threatened. Ajay Mehra, Ahmad Salam, Zakir Thaver, Amit Singh, Rasheed Talib, Surendra Singh, Ashoke Chatterjee, Usama Khalidi, Omar Khalidi, Bikramjit De, Venny Singh, Krishna Omkar, Balesh Kumar, Bobby Kewalramani, Amit Chatterjee, Deepak Kumar, Anuradha Kapur, Jack Jacob, Jayant Goswami, Anindita Balsev, Nandita Das, Amir Khan, Ashwini Sharma, Sushil Raj, A. R. Shervani, Rajinder Puri, Satyaki Dasgupta, Bhaskar Barua, Kalarickal Fabian, Prabhu, Guptara, Bhagirath, Aseem Andrews, Pankaj Das, Chris Johnson, Gautam Hooja, Iftekhar Alam Khan, Iqtedar Alam Khan, and Mohammad Shamim Akhtar. I owe an enormous gratitude to all of them, and hope that many, if not all, will be in the audience for the first night. Their contributions and good wishes have undoubtedly made the final version of the play more enjoyable; the remaining inaccuracies and shortcomingsare of course entirely my own responsibility. I am extremely grateful to Shomit Mitter for an exhaustive opinion. Shomit, whom I reviscovered after years; an eminent writer and a fellow Stephanian; as also to my school days friend Partha Chatterjee, now a renowned filmmaker and cultural critic of refined taste and Rajiv Shahare, my friend at DPS Mathura Road, and a prominent theatre artist of St Stephen’s college. I hope I have the support of historians Mushirul Hasan, Mukul Kesavan and Zia Nadwi. Nadwi sahib’s views on certain aspects of Mughal history are very valuable became of his knowledge of Persian and understanding Islamic history. Rudrangshu Mukherjee with whom many Oxford weekends became endless arguments. I owe a special gratitude to Mr R. K. Mehra who clinched a casual conversation triggered by Twilight in Delhi and very generously took the initiative to publish the play under the banner of his distinguished publishing venture, Rupa and Company. That indeed puts me unexpectedly in good company of some very successful authors and playwrights whose works I have admired and enjoyed over the years. I owe a final word of gratitude to my wife, Louise Khurshid, whose experience in writing is much longer and continuing intention to write, more ambitious than mine, but who put it all aside temporarily to type and retype the drafts, transforming a virtually indecipherable scribble into a readable play script. The little domestic ‘India’ we live in together and share in many private and public ways has three other partners, our sons: Zafar, and the younger twins, Samar and Omar (the first two are studying history and the third is making his way to the philosopher’s cave!). There is sadly one person physically missing in that little India, our first born daughter, Ayesha, who tragically passed away at a young age in 2002. The play was born during a holiday we had all spent together in Goa several years ago. Like a beautiful Mughal princess she has retreated behind the veil of mortality, but is always in our thoughts. I know that in her inimitable and irrepressible manner she would have demanded to know why only sons of Babur are mentioned and not daughters! A word of caution about the poetic license I have taken for dramatic reasons: it is well intentioned and hopefully will not distract on grounds of historical inaccuracy. The art and life debate, after all, must continue on stage, as indeed it does elsewhere in the India we know and cherish. 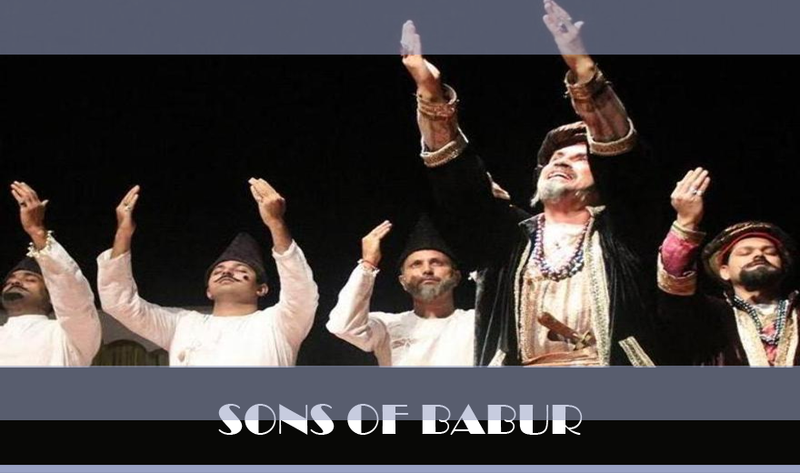 The idea of writing a play on Bahadur Shah Zafar’s life first occurred to Salman Khurshid Sahib some seven years ago, at an unlikely venue, sitting on a beach in Goa. Being an active politician, that too in adverse circumstances, writing a play was not the easiest of tasks, but the idea stayed with him. The approach of the 150th anniversary of the great rebellion of 1857 provided an element of urgency to finish the play as well as seize the opportunity via the play to rethink and situate Bahadur Shah Zafar’s role in the great rebellion and also in Indian history.Salman Sahib’s interest in Bahadur Shah Zafar dates back to his schooldays. Although he was not a formal student of history and had very little time for Bahadur Shah Zafar, nevertheless the last Mughal captured his imagination not only as an intriguing tragic figure in Indian history but also as one of the most endearing, easy to understand, Urdu poet. Urdu is Salman Sahib’s mother tongue, but his interest in Urdu flowered only during his days at Oxford but was consciously nurtured in the years that followed. Many of Zafar’s mellifluous ghazals like, ‘lagta nahin hai ji mera ujare dayar mei/kiski bani hai alam . . .’ were extremely popular and, therefore, became for Salman Sahib’s the natural stepping stones to the understanding and appreciation of Urdu poetry. Although the idea for this play germinated many years ago, and he first put pen to paper at that time, it remained for a longtime, perhaps several years, in just a few loose sheets of papers he had periodically scribbled upon. Gradually the script developed into a sheaf of papers that needed to be bound together like a diary of sorts and in which Salman Sahib took notes and wrote passages of the play, sometimes in the most uninspiring intellectual conditions. Research was possible only when he travelled and used the time to read and write. It was only recently, with the 150th anniversary of 1857 finally having arrived and the topicality becoming obvious, that he has made a special effort to complete the project. There are several related themes in the play but the central theme, as the name itself suggests, is about the relationship of India and all Indians, with the history of the Mughal Empire and consequently the role that the Mughal Empire played, in the development of the modern idea of India. In recent years, many scholarly works have dealt with the idea of India and indeed with the engagement of what Indian identity means. In our own country identity has variously been sought in cultural roots, religion and community and group aspirations and linguistic association. These are matters of great public importance, not only in the arena of politics but also in other important areas of endeavour. Therefore the idea of India, and subsumed within it, the relationship between Hindus and Muslims in particular but indeed of people of all hues, religions and subcultures that have converged into that idea, is what he wished to explore. I felt that in its historical context it could best and most effectively be explored by looking at the Mughal dynasty starting with Emperor Babur and culminating in the devastating outcome of 1857 that led to the exile of the last Mughal Emperor, Bahadur Shah Zafar, to Rangoon. (now Yangon). ‘Babur ki aulad’, is now a familiar pejorative that one comes across in politics or in the literature of an extreme hue – used by people. Who believe in exclusivity of their notion of Indian culture, the supremacy and superiority of a particular brand labelled ‘Bharatiyata’. Liberals have strongly repudiated that view and one hopes that the majority of the people of this country will always refuse to accept it, as indeed we saw in the aftermath of the tragic events that took place with the demolition of the Babri Masjid in Ayodhya and later, in Gujarat. This pejorative terminology therefore became for Salman Khurshid the starting point. He has attempted to map the emotional distance traversed from Babur to Bahadur Shah Zafar through the route of identification: Why was it that a remarkable young warrior from Farghana, in the country of Uzbekistan, who journeyed across the Hindu Kush mountains to lay the foundation of a vast empire in Hindustan, couldn’t give up Kabul even in death; yet how his descendants developed such deep feelings for Hindustan that the last amongst them wrote some of his most beautiful poetry in anguish at the loss of that motherland? In that transformation he has endeavoured to find the historic and emotional explanation of the idea of India. I believe that the commonly understood idea of India is far from complete, certainly in terms of a definitive description. In the realm of emotions it is made up of all those who intuitively feel it and sense it, identify with it despite conspicuous variance in social matters and languages spoken at home. The concepts of citizenship, nationality, domicile, sons and daughters of the soil, etc. are often used and misused, even conveniently morphed from time to time and from place to place to suit historical protagonists. Therefore, an objective search for the ultimate or near absolute norm is what the play attempts to undertake but conscious of the uncertainties emphasised almost every day by events in contemporary India. There are other themes as well in the play. In order to catch the attention and imagination of a contemporary audience, it was important to relate to something of our daily lives. Indeed history or the past inevitably has a link with the present – what happened yesterday. Influences, directly or indirectly, what happens today; what happens today can often be explained in terms of what happened yesterday. But not everyone has the foresight, knowledge, or patience to work out the role of history; those who do, stand to gain in terms of advantage in handling contemporary challenges much better. But even as a play, as part of contemporary literature, in order to engage the modern consciousness, it is important to emphasise themes of a topical interest. In this context, some themes have been consciously developed – of generational change; sibling rivalry and ambition; the acceptance of violence and submission to violence as a way of life; the desire amongst successful people to be rid of the trappings of power and to get absorbed in a spiritual tradition (as did Humayun, Akbar, to some extent Jehangir, certainly at one point in Shah Jehan, and surprisingly, even in Aurangzeb, not to speak of Bahadur Shah Zafar!). There is another interesting contemporary theme that adds a dimension to our understanding of Islam – the role of women in administration or governance; here the remarkable example of Noor Jehan and her dramatic influence during Jehangir’s reign is most interesting. The Hindu-Muslim issue was one that the Mughals struggled with intensely even if it is seldom remembered that Babur defeated a Muslim adversary at Panipat. The most dramatic effort made to overcome the religious divide was the taking of Rajput princesses as royal brides and making them Mughal queens. It is curious that the proud and valiant Rajput families were willing to establish ties of kinship with the Mughals by giving their daughters in marriage. However, that remained a one-way process. There is no explanation of why the Mughal princesses remained unmarried all their lives within the confines of the harem; not once was it ever thought that there could be the possibility of their being married to Rajput rulers.Therein, perhaps, is the key to the symbolic acceptance of the Mughal dynasty as the true sovereigns of India. Much as some narrow-minded. People may try to label them foreigners and invaders, even a blind and helpless Mughal king was made to sit on the throne by the Marathas because it was felt that they could not do without the Mughal sovereign’s legitimacy. There were many powerful warrior chiefs and rajas from Rajputana and elsewhere, including those who resisted the Mughals but none seem to have aspired to be seen as the sovereign of Hindustan. On the other hand, the Mughals from the time of Babur were acknowledged as emperors. Even Humayun having lost everything in the Battle of Kannauj and being forced to stay away from Hindustan for thirteen years, was referred to as the Emperor by Sher Shah Suri. After the latter’s death, Humayun quite easily came back as the Mughal Emperor. During the period that he was away, he was seen not as a pretender to the throne of Hindustan but as the Emperor in adversity. Indeed it was this very aspect of the Mughals as symbols of sovereignty that was critical when Bahadur Shah Zafar, a hopeless pensioner of the British inside the confines of the Red Fort, and whose authority probably didn’t even run in the entire Red Fort, became on 11 May 1857, the symbolic face of resistance to the British and the natural leader of India’s First War of Independence. The soldiers of the Bengal army marched from Meerut to the Red Fort in Delhi in the hope that Bahadur Shah Zafar would be willing to lead them into battle spiritually, ideologically, morally, and perhaps, even physically. How difficult that challenge was for Bahadur Shah Zafar is reflected in the play and indeed is very well documented in a series of books that have been published on the occasion of the 150th anniversary of 1857. The symbolic significance of Bahadur Shah Zafar or the Mughal king as it were, even at a time when there was virtually nothing left of the Empire and the emperors were mere shadows of their past glory, is something that reaffirms the thesis of psychological acceptance of the Mughals as true sovereigns of India. Therefore the argument of their being foreigners and alien to the land stands truly refuted by history. This acceptance is, I believe, also the strength of the idea of India today. (a Mongol) and Ibrahim Lodhi (an Afghan). The victor then wiped out potential resistance in Rajputana, both by winning over Rajput rulers as friends and by defeating the ones who chose to become adversaries. Over the years, the Rajputs became an intrinsic part of the military structure of the Mughals with several important and decorated generals in the Mughal army. On the other hand, those who celeberate non-Muslim rulers of different parts of India challenging the authority of the Mughals as the true representatives of Bharat, must also admit that in many cases, as with Shivaji, there may have been resistance of sorts but there was also a general submission to and acceptance of Mughal sovereignty. Indeed even when the armies of Aurangzeb and Shivaji confronted each other it was quite often a Rajput general on behalf of the Mughals engaged Shivaji’s Muslim generals. The simplistic and constricted view of history that denies the composite culture and its birth during the Mughal dynasty is, I hope, successfully repudiated in this play. I hope that this play gives us all a fresh opportunity to think about the idea of India that we all hold dear, an India that despite severe challenges, cracks, strains, and conflicts, we all cherish and are determined to help succeed as a unique modern civilization.